For the past 3 years, emerging markets economic has seen a significant gain compare to developed countries (USA and Europe). Investing in this market can be done through Emerging Markets stock mutual fund. 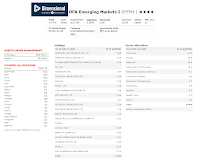 One of the best rated diversified emerging markets equity funds is DFA Emerging Markets I fund. Details about the fund's review is described below. As part of international stock fund, the DFA Emerging Markets fund seeks to achieve long-term capital appreciation. This EM Equity fund usually invests most of its assets (>80%) in the Emerging Markets Stocks. It buys broad market coverage of larger companies associated with emerging markets, including frontier markets (emerging market countries in an earlier stage of development). Karen Umland is the fund’s manager of this emerging markets fund since December 1998. This DFEMX fund was introduced to public 17 years ago (April 1994). The expense ratio of this fund is 0.60% per year. This is a no load fee, meaning it doesn’t have a front end sales load or deferred sales load. It also doesn’t have any management fee or 12b1 fee. It has a yield of 1.46%. The last dividend distributed was in June 2011 ($0.18). The total net assets are $ 2.5 billion. This Dimensional Fund Advisors fund can be purchased from 28 brokerages, such as JP Morgan, Schwab Institutional, Pershing Fund Center, Scottrade NTF, Protected Investors of America, Invest n Retire, etc. As of June 2011, the top 5 countries allocation of this best stock fund is South Korea (14.94%), Brazil (13.89%), China (13.53%), Taiwan (12.15%) and India (9.45%). The top ten holdings as of July 2011 are Samsung Electronics Co Ltd (2.89%), America Movil SAB DE CV (2.14%), Taiwan Semiconductor Manufacturing Co Ltd (2.09%), Gazprom OAO (1.94%), Petroleo Brasileiro SA (1.59%), Vale SA (1.56%), Sasol Ltd (1.36%), Itau Unibanco Holding SA (1.34%), MTN Group Ltd (1.34%) and China Mobile Ltd (1.31%). The top sector allocations of this DFEMX as of July 2011 are Financials, Energy, Materials, Information Technology and Telecommunication Services. According to the fund’s prospectus, the principal risks associated with this emerging markets investment fund are market risk, emerging markets risk, and foreign securities, and currencies risk. 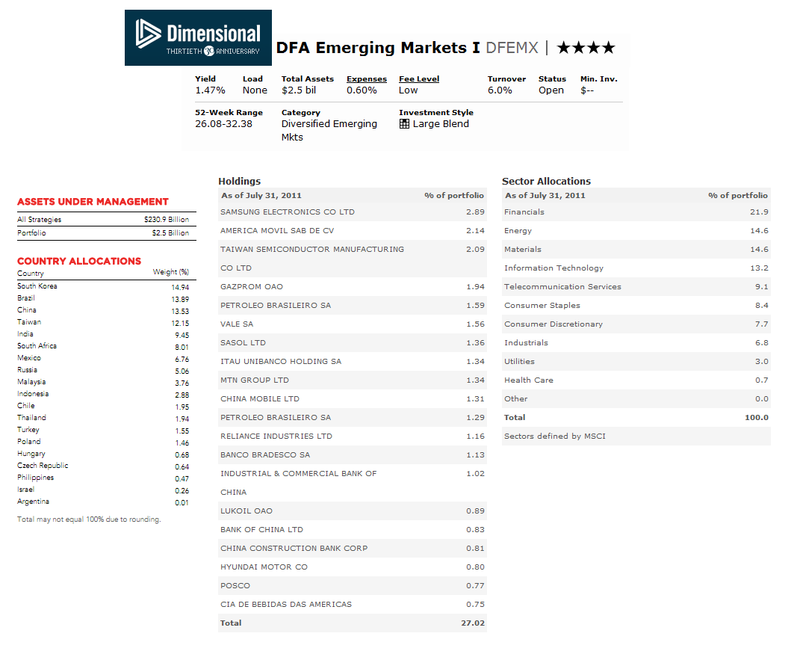 The other similar option for the best diversified emerging markets fund is DFA Emerging Markets II Portfolio (Ticker: DFETX).